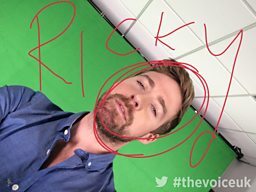 Oh yes, we can believe it, Ricky Wilson is definitely not far away from home… his Voice home, that is! The dapper gentleman and fearless leader of the Kaiser Chiefs returns for a second time, and is back doing what he loves to do best… spinning around in his big red chair! Ricky and his band have also had the honour of performing at the London 2012 Olympic Closing Ceremony to millions of people around the world, and we bet he'd have won gold if live music was a sport. He’s also recently toured the USA (that's in America) and will be embarking on a massive UK tour that kicks off in 2015. So, support your local Kaiser Chief and tune in to show your love for #TeamRicky! It's time for The Voice Live shows...but first let me take selfie! #TeamRicky are looking very Chic! Team Ricky with Nile Rodgers image. Ricky's throwback thursday. Image of Ricky Wilson when he was a baby. New to The Voice UK? Find out about the Blinds, Battles and Knockout stages. Find out the latest headlines and gossip with The Voice UK blog.